I am going to be working with nichrome wire; so, I thought I would explore some of it’s properties. This is the result. For a given wire composition and gauge, the steady-state temperature in still air is entirely determined by the current through the wire. In other words, the wire length is irrelevant. The thermal resistance of a straight wire in free still air is NOT constant over temperature. For pulse width modulation of either a constant current or constant voltage supply, the temperature rise is approximately proportional to the square of the duty cycle. For example, compared to 100% duty cycle, 50% duty cycle yields 25% temperature rise. This approximation holds true, ±10%, for ΔT < 600°C. Due to thermal expansion the nichrome wire will get about 1% longer for every 700°C of temperature rise. Nichrome is a metal alloy consisting of primarily nickel and chromium. Varieties of nichrome are available with different proportions of nickel and chromium as well as small amounts of other elements. The more common varieties are nichrome-80 (most common) and nichrome-60 which are approximately 80% and 60% nickel, respectively. Both varieties have maximum operating temperatures of about 1100°C – 1200°C (¹) and melting temperatures above 1400°C (¹). The chromium will form an oxide layer on the wire’s surface which protects the wire from corrosion. The corrosion resistance, the high melting temperature, and a higher resistivity than many other metals makes nichrome a good material for electrical heating elements. I could only think of one way to accurately measure the temperature of a wire in free still air that did not depend upon knowing the physical constants that I was trying to measure – a thermal camera, probably requiring a close-up lens. Since I didn’t have one I had to rely on data from wire manufacturers. For this discussion I used data from three companies selling nichrome wire, Omega, WireTronic, and Pelican Wire. The data from the three sources does not entirely agree. Unless otherwise stated, all data is for 30 gauge wire. Like all conductors nichrome’s resistance varies with its temperature. 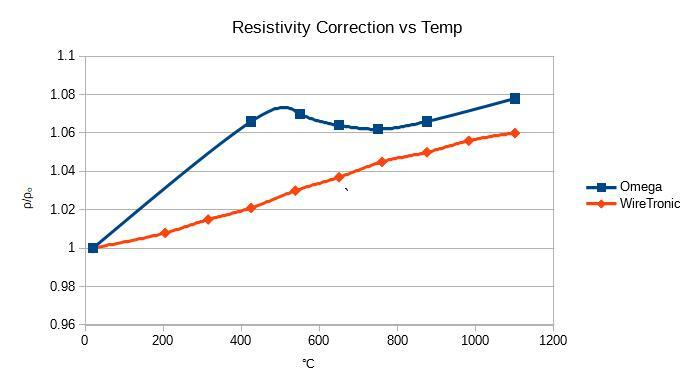 Where α is the temperature coefficient of resistivity, Rₒ is the resistance at the reference temperature, Tₒ, which is usually 20°C. For nichrome, α is often given as a constant ≈ 0.00017 °Cˉ¹. The α for nichrome is much lower than that for most common metals. For example, the α of copper is 24 times that of nichrome. The α for nichrome is not just low relative to other metals; it is a very small value in absolute terms. Even with a temperature change of 1000°C the resistance only increases by 7%. Something that surprised me is that α may not be constant across temperature. I plotted values for “ρ/ρₒ” versus temperature given by two nichrome wire manufacturers. WireTronic’s data shows a nearly constant value for α across temperature; indicated by ρ/ρₒ being a straight line. But strangely this constant value for α (≈0.00006 °Cˉ¹) is very different from the typically quoted value of 0.00017 °Cˉ¹ for nichrome. Omega’s data shows α changing a lot over temperature; but from 20 °C to 400 °C Omega shows exactly α = 0.00017 °Cˉ¹. It’s a good thing that α is too small to matter much. But I used the data from several nichrome wire data sheets to plot θ for a 1 foot long wire. θ = I^2 * R / ΔT, where R is the resistance of 1 ft of wire at T = Tₒ + ΔT. Notice how θ varies significantly with temperature. For my purposes I can just treat θ as an unknown constant for any given steady state conditions. For a constant current source driving a nichrome wire, the properties, θ, α, and ρₒ are independent of the wire length; so, the temperature rise (ΔT) is also independent of the wire length and is only a function of the current (I). 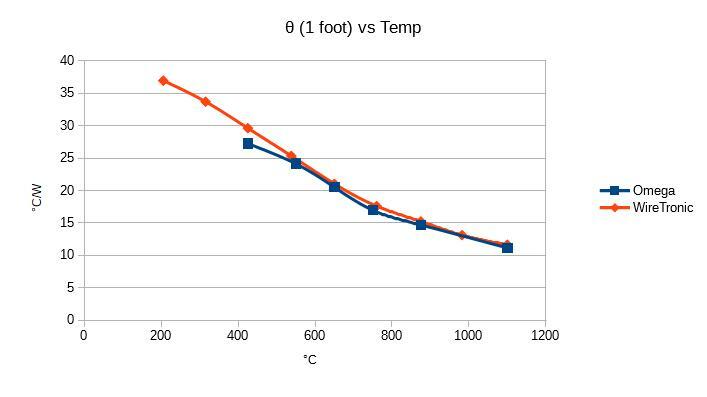 I gathered the current versus temperature data from three sellers of nichrome wire. 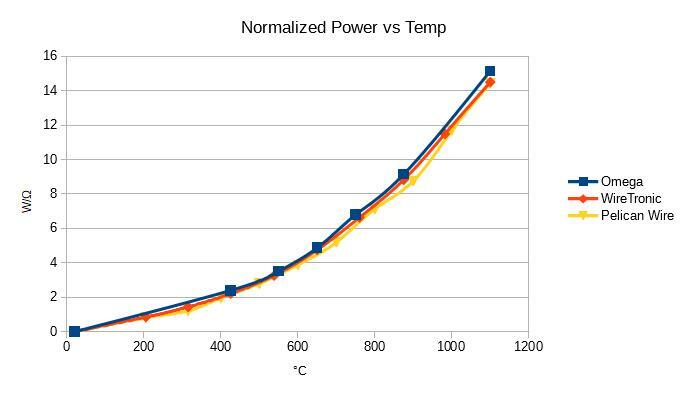 I plotted the normalized power, Pn = I^2 * ρ / ρₒ, versus temperature. Pelican Wire did not provide data for ρ / ρₒ, so I set it to 1. As you can see from the graph it made almost no difference because α is so small. If α and θ were constants, the graph of normalized power versus temperature would be a straight line – but it is not. The wire’s temperature rise (ΔT) varies with the square of the voltage (V) and varies inversely to the square of the wire length (L). Since θ is also a function of temperature these relationships are not proportional. So for a constant voltage supply, it is difficult to predict the temperature of the wire analytically and repeatibility depends heavily upon matching the length of the wire. Most materials will expand when their temperatures rise. The amount of this expansion is expressed by the following formula, where α is coefficient of linear thermal expansion. The coefficient of linear thermal expansion for nichrome wire is 14.0E-6. This is an average. The coefficient varies by 5%-10% from 20°C to 1000°C. The wire will get longer as it gets hotter – about 1% longer for every 700°C of temperature rise. If your application requires the wire be stretched tight; it might be a good idea to provide a spring mechanism to compensate for expansion and keep the tension constant. This entry was posted in Informational on May 18, 2018 by Paul Bryson.